Bursting with flavor, crispy roasted cauliflower gets tossed in a smoky, tangy version of molé sauce in these vegetarian tacos. Toss the cauliflower florets with olive oil, salt and pepper. Roast at 200˚C until browned and beginning to char, about 15 minutes. Set aside. Char the guajillo chiles in a cast iron pan until browned, but not blackened. Remove from heat and remove the stems and seeds. Soak the chiles in 250 ml warm water. Meanwhile, in the same cast iron pan, char the tomatoes, garlic and onion. Remove the chiles from the water, and include this water to prepare the Knorr®Brown Gravy according to package directions. Puree the brown gravy with all ingredients and season to taste. Warm the tortillas over a grill or open flame. Toss the cauliflower with enough mole sauce to coat. 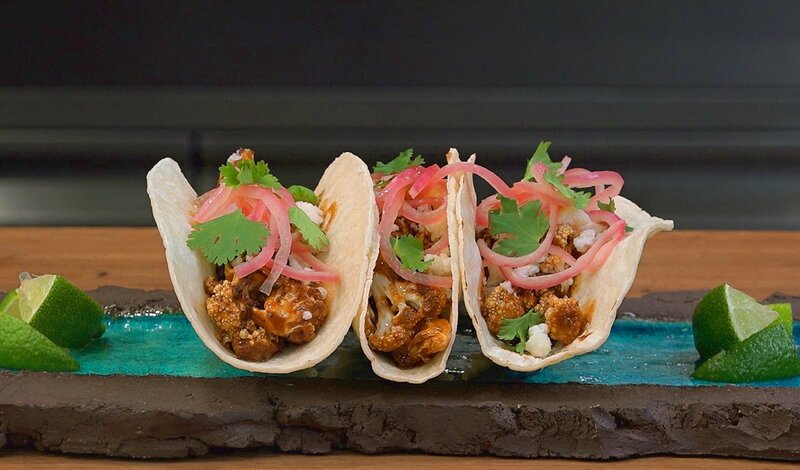 Build each taco with cauliflower, cotija cheese, pickled red onion and cilantro leaves. Serve with lime wedges.